The CT01 is the product of a restructured technical team, with many engineers following Mike Gascoyne into the team. Many came in too late to have an influence on the previous car, but the CT01 is destined to move the team up from the 10th place in the constructors standings which they have occupied in the two years since they entered F1. One of the most distinctive changes compared to its predecessor is the new nose cone. The particular shape is the result of changed regulations which aimed at lowering the tip of the nose to a maximum of 550mm above the reference plane. While the change would still allow for elegant nose designs, cars rely on high noses to get as much air as possible under the car and through the diffuser to generate downforce. Apart from the obvious change in the front, Mike Gascoyne and his team have also managed to shorten the sidepods dramatically, reducing the internal volume in the sidepods. To prevent the car to overheat, a tail funnel has been created to exit hot air just above the gearbox. The similarities in design are unsurprisingly similar to Red Bull's design philosophies. 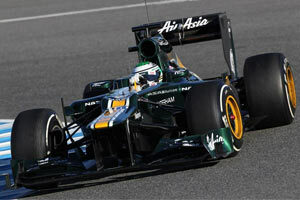 In essence, it has the same drivetrain, as Caterham now have a Renault engine coupled to a Red Bull gearbox. This also mandates the pullrod suspension at the rear end of the car. One day after the official unveiling, the team's technical director Mark Smith also revealed that the KERS batteries were mounted on each side of the gearbox, just as Red Bull had done on their Red Bull RB7. Finally, the exhausts are located quite low and in the wake of the sidepods' airflow. It means the exhausts are not visible when looking at the car from the front. Due to their position, Caterham is looking to blow the exhaust gases onto the beam wing, at least in the launch version of the design. Despite the improved technical organisation, the Caterham CT01 was hardly any more competitive that its predecessor. The team again battled with Marussia for 10th in the constructors' standings, and only managed to secure it at the final race of the season where Vitaly Petrov finished 11th, after passing Marussia's Charles Pic, the latter having already signed a contract to race for Caterham in 2013.